The wolfCrypt cryptography engine is a lightweight crypto library written in ANSI C and targeted for embedded, RTOS, and resource-constrained environments - primarily because of its small size, speed, and feature set. It is commonly used in standard operating environments as well because of its royalty-free pricing and excellent cross platform support. wolfCrypt supports the most popular algorithms and ciphers as well as progressive ones such as HC-128, RABBIT, and NTRU. wolfCrypt is stable, production-ready, and backed by our excellent team of security experts. It is used in millions of application and devices worldwide. 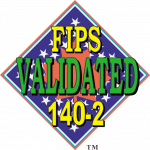 A version of the wolfCrypt cryptography library has been FIPS 140-2 validated (Certificate #2425). For additional information, visit the wolfCrypt FIPS FAQ or contact fips@wolfssl.com. wolfCrypt is included in the wolfSSL package. wolfCrypt is built for maximum portability and is generally very easy to compile on new platforms. It supports the C programming language as a primary interface. If your desired platform is not listed under the supported operating environments, or you have interest in using wolfCrypt in another programming language not currently supported, please contact us. In addition, wolfCrypt also supports hardware cryptography and acceleration on some platforms. To see a list of platforms that are supported, please see our hardware cryptography support page. Support packages for wolfCrypt are available on an annual basis directly from wolfSSL. With three different package options, you can compare them side-by-side and choose the package that best fits your specific needs. Please see our Support Packages page for more details or contact us with any questions. For license information, please see our Licensing Page. For benchmarking information or data, please visit our Benchmark page or contact us for more information. Module Isolation - Individual algorithms and ciphers are able to be easily broken out of the wolfCrypt package and used independently. If you would like to learn more, please contact us. Interested in getting trained by the wolfSSL team on subjects related to wolfCrypt and/or wolfSSL? If you would like to use or test wolfCrypt on another chipset, let us know and we’ll be happy to support you. If you would like to test wolfCrypt on another environment, let us know and we’ll be happy to support you. wolfCrypt is dual licensed under both the GPLv2 and commercial licensing. For more information, please see the following links.